In what could be called Zambia the Real Africa, a court file documenting the seized Movement for Multi-Party Democracy vehicles has gone missing at the Lusaka High Court registry. This came to light Thursday afternoon when the matter in which the former ruling party has sued the government for the release of 101 vehicles came up for continued trial before Lusaka High Court Judge Anne Sitali. There is a serious possibility that these vehicles hve been stolen by the PF and it could be one of the reasons Michael Sata and his colleagues want the MMD decimated so that no one will ever follow up the matter. Sadly for PF, the MMD is recovering from the 2011 defeat. The matter which was initially scheduled to take off the Thursday morning was adjourned to the Afternoon but when the matter came up, the Judge told the parties that the court file has gone missing in the registry. MMD Acting National Secretary Kapembwa Simbao and his Deputy Chembe Nyangu were scheduled to testify in a matter that was reaching closing stage.The MMD is being represented by Lusaka Lawyer Sakwiba Sikota while the government is being represented by lawyers from the Attorney General Chambers. What is surprising however is that the development comes at a time when MMD Information and Publicity Secretary Alfred Ndhlovu has been exchanging strong letters with Inspector General of Police Stella Libongani over the seized vehicles. Ndhlovu in a letter dated August 20, 2013 to Libongani demanded the return of vehicles that were not on seizure notice. Libongani in her reply dated September 2, 2013 refused to handover the vehicles. 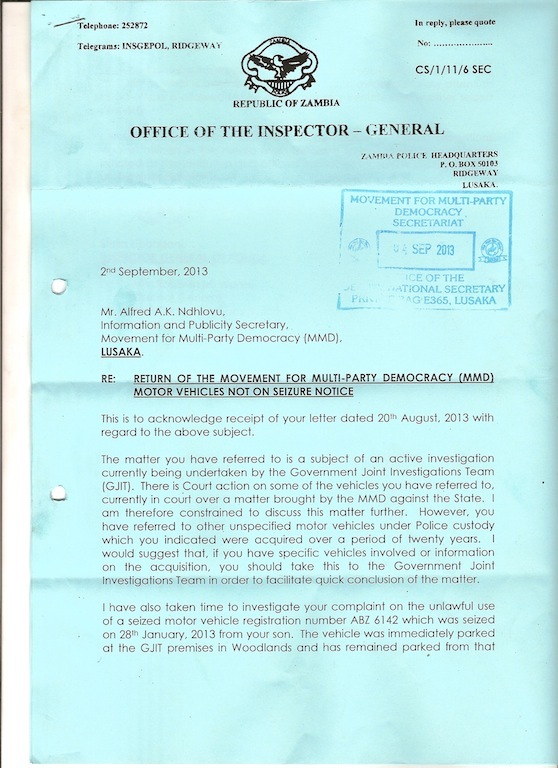 Ndhlovu again in a letter dated September 06, 2013 reaffirmed the party’s position that the vehicles not indicated on the seizure notice should be returned to the party. Yesterday on the 12 /09/13 just six days after Ndhlovu’s reply to Libongani’s letter, the file has gone missing at the highly secured Lusaka High Court Registry. It is up to the members of public to speculate.